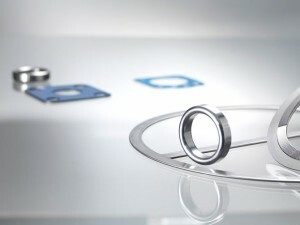 Semi-metallic (combined) gaskets and industrial seals are designed for sealing up flat flange joints of various systems in all industrial sectors, especially for petrochemicals, chemical industry, oil production, food industry and in general industry applications. They are designed for normal as well as heavy-loaded flange joints, pipe lines, heat exchangers, absorbers and specific apparatuses. It is always necessary to take into account the criterion of tightness class and to select the most appropriate type of seal according to the specified requirements. For higher tightness classes or especially for dangerous substances, we recommend applying DIMERFLEX ST (Spiral wound gaskets), DIMERFLEX PT (Camprofile gaskets), DIMERFLEX OT (Metal Jacketed Gaskets), as well as other flat gasket types DIMERSIL (Compressed fibre gasket materials), DIMERGRAF (Expanded graphite gasket materials), DIMERFLON (Filled PTFE gasket materials) depending on customer's specifications. Correct sealing of flanged joints can be achieved by considering the suitability of the flange type (including seating surfaces), by using of a correct gasket, the type and quality of connecting material, a correctly selected type of installation and gasket application. For demanding operating conditions, the calculated tightening torque is a very important aspect. We are ready to recommend you and consequently implement the most appropriate alternative.